My newest book: 20 things I Know For Sure: Principles for Cultivating a Peaceful Life will be available in the fall of this year, 2019. Watch for it on line and at your local bookstores. 52 Ways to Live the Course in Miracles, is available everyplace right now. It’s my current favorite, of course, because of my constant adherence to the Principles that are the core of A Course in Miracles. I can assure you that my life would not be spiritually on track if I weren’t committed to “the course,” AA and Al-Anon. The three programs blend beautifully and the essays, in this book, although pretty tightly influenced by just “the course,” will speak to anyone who is searching for a greater connection to that Inner Voice that always offers us the pathway to peace. Living Long, Living Passionately, 75 (and counting) Ways to Bring Peace and Purpose to Your Life. This book pleases me greatly. It speaks to exactly where I am in my life today. I have grown into my final chapter and yet, I am far from being done. Every day remains as exciting and full of promise as I make it. And that’s my goal for every one who reads this book too. We are not done. We are moving forward. With purpose, with hope, and with intention to make a difference in at least two lives every day: our own and one other person’s. With that goal in mind, life will be full of promise as long as we put one foot in front of the other. This book promises to inspire you. The Good Stuff, from growing up in dysfunctional families. This book will find its home in nearly every family. Virginia Satir, a psychotherapist, in the 1970’s, said 98% of all families were dysfunctional. My experience in 12 step rooms over the last 40 years would find her remark spot on. But that’s not really a bad thing. There is plenty of help available for these families. It’s been my intent with this book to provide some of that help by telling the stories of individuals who grew up in dysfunctional families but rose above that to be resilient, successful, hopeful and best of all, willing to help others find what they found. Getting Unstuck: A Workbook Based on the Principles in Change Your Mind and Your Life Will Follow is bound to help every person who really wants to change his or her life. Sometimes we need a bit of extra coaching to make the changes we really do want to make. This book offers all of those tips and suggestions for how to make changes stick in our lives. It’s not always easy but no change anyone really wants to make will elude you forever. I can promise you this. My Story to Yours was a labor of love. Beginning with my childhood in IN and culminating with the life I currently enjoy with my husband, Joe, in MN and Florida; I share with readers the many ups and downs of a life well-lived. I don’t avoid the multiple pitfalls that are common to recovering alcoholics and addicts. They mark our growth through life, I think. But I do stress the beauty that’s available to any one of us who commits to the life-changing opportunities that call to us. I think the real gift of the book, however, is that it includes my invitations, throughout, for you to delve into your life experiences too. Doing the “search” together makes doing it at all so much easier. This is a book to enjoy in a special way. My book, Peace A Day At A Time, is available at all bookstores and amazon.com too. It’s a collection of the best meditations from some of my earlier meditation books, an idea that has been in the works for a few years. It includes a subject index for easy reference if you are looking for help of a particular nature. I am extremely satisfied with this book and the selections included because they reflect those very yearnings that I think are common to all of us. No frustration goes unaddressed. Every concern has a solution and it will be discovered here. those we travel with. 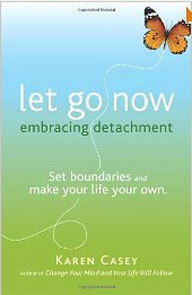 Detachment does not mean cutting ourselves off from others. However, it does mean not letting those other people define us or determine how we feel moment by moment. It allows us to live our own journey and respect the journey of others too, embracing the knowledge that our greatest gift to one another is to let one another “go” to learn what they are here to learn without out our interference. It is hope—the ability to push past fear and open our minds to new possibilities—that empowers us to bring about positive change in our lives. Yet, amidst personal tragedy and the turmoil of world events, many of us struggle to sustain a sense of hope for tomorrow. In Cultivating Hope, it’s my intent to reveal everyday ways that we can open our hearts and minds to the awesome power of hope. For each week of the year, I offers a guiding principle with an accompanying essay that, if studied and explored, can help each of us achieve inner peace and a positive outlook. Themes include how we can heal through the expression of love, gain a fresh outlook by striving to understand our anger, and free ourselves of constraint by letting go of judgment. This is a collection of stories about people who survived the gripping control that codependency had over their lives. But even more importantly, being free of the ‘attachment’ to another person allowed each of them to become who they were meant to be. These stories reveal the possibility for change that is ever present for every one of us. Hope is in ready supply within every story. For a vast majority of girls in this country, there comes an age at which self-esteem, self-assurance, equilibrium, and confidence fly out the window. Maybe it’s hormones, maybe it’s culture, or maybe it’s just called growing up. Whatever the cause, it’s real. Some girls turn, in their own fashion, to the same addictive solutions as their elders: compulsive behavior–either in the form of alcohol, drugs, food, or something equally destructive. This book will change everything if you let it. It’s Up to You is based on the twelve principles in my book, Change Your Mind and Your Life Will Follow: tending to our own gardens, focusing on solutions not problems, letting go of preconceived solutions, changing our minds, acting instead of reacting, giving up judgments, giving up trying to control, discovering our own lessons, doing no harm, quieting our minds, treating every encounter as the holy, and discerning our mind’s own truth. A small, gift-sized book that carries a tiny nugget of hope for living more peacefully and with greater intention on each page. I know my recovery works best when I keep my focus small, on only what lies before me in the moment and sharing the decision making that needs to be done with my Higher Power. That’s what this book guides the reader to do. It will be available from Hazelden and at local bookstores. These days our lives can feel so hectic and out of control, so lacking in hope and joy. And yet every day, opportunities to experience joy and create peace filled lives come out way. We have within us the enormous potential to create peace. It’s a matter of how we view the people and experiences in our lives. Acting from a place of love contributes to the well-being of all humankind. This book contains essays coupled with simple suggestions that show the reader just how accessible a peaceful life really is. The book can be read in short spurts while waiting for a meeting to begin or over coffee or at bedtime. Any time is a good time for a quiet, hope filled thought. More than 38 years ago I wandered into a support group and learned there was only one thing I could change–myself! I found a group of people who had adopted this concept–and I eagerly joined them. The result? Change so profound that I have dedicated much of my life to teaching others about it. Change Your Mind and Your Life Will Follow offers a dozen simple principles to live by. Each principle makes up a chapter. Each chapter includes meditation-style essays to help readers access peaceful, life-changing responses to just about any situation. It really is as simple as changing our minds. This little book will show you how. The book that started it all. The original 366 thoughts from Karen’s first meditation book about hope and recovery. Find inspiration and guidance for dealing with the challenges and new experiences of recovery in the writings from a woman who cares about others. This beloved author writes about self-esteem, friendships with other women, hope, attitudes about life and relationships, and more. Her words help bridge the gap between self and Higher Power, between loneliness and sharing the emotions of recovery. The often life-saving gift of sponsorship carries a powerful message for all of those in recovery and is especially compelling for anyone new to recovery. This is a moving and hope-filled book that explains the role of sponsorship and the important role it plays in recovery. This book helps newcomers in recovery as well as longtime veterans of Twelve Step programs understand how sponsorship ends isolation and strengthens the connection to a supportive fellowship. This one is no longer in print but used copies can be found. Simple Rules for Lifelong Contentment. Tending our relationships is our highest calling as human beings. All of our relationships—with loved ones, coworkers, neighbors, and even strangers—provide opportunities for us to not only enrich our lives but also to create a more nurturing world. Drawing from her own life experiences and lessons learned the hard way, Casey offers wise counsel about what helps and what hinders relationships. Her insights are at once familiar and revealing, reminding us of simple truths we inherently know but need to rediscover for ourselves again and again. Offers simple guidance to the girl, 7 to 10 years old, as she struggles to understand the many dilemmas faced by young girls. A great book for a girl and her parent to read together. This instructive, insightful collection of daily meditations has been written to guide young girls in making better sense of their daily activities, defining their changing values, healing troubled familial relationships, and handling struggles with friends and strangers. Ultimately, young girls will be better able to grow through their feelings of insecurity, and learn how to speak their own honesty while listening to their own hearts. A book of daily thoughts for girls ranging in age from 11 to 15. Girls struggle, on a daily basis, with their emotions, their friends, their siblings and their parents. This book will help them answer questions and will guide them in the discussions they can have with adults. A valuble series of daily meditations to accompany and enhance personal study of A Course in Miracles, the modern spiritual classic that has touched the lives of millions. Each page of Casey’s book offers an aphorism and a reflection on a key concept in the Course. These 366 thoughts rely on the principles of A Course in Miracles. These thoughts, when applied, will change the course of one’s life. Peace is attainable. A collection of 366 meditations. This book was reissued following a major redesign and reorganization. It’s new title is Peace One Day At A Time. Every stage in life brings a unique set of challenges and opportunities-and our later years are no different. This daily meditation guide for older adults offer words and wisdom on such issues as redefining life after retirement, finding new activities, living at a different pace, diminishing physical skills and energy, and coming to terms with loss. 366 thoughts offer encouragement and hope to older adults who may be struggling with the changes that accompany aging. Daily meditation guide for older adults, captures the words of the aging themselves. Collection of wise, compassionate daily meditations for women now living a sober life and seeking spiritual fulfillment. Topics include facing challenges, having faith in a Higher Power, taking responsibility, and more. Reflecting the strength and confidence that can come from years of living the program, A Woman’s Spirit includes sections on challenge, faith, responsibility, expectations, change, and purpose – issues at the heart of a revovering woman’s journey. A book of daily thoughts for men and women who suffer from the pain of codependency. Defining our boundaries from others promises us the peace we deserve. These direct and affirming meditations offer daily access to strength, serenity, and insight in our relationships with chemically dependent people. These reflections gently guide friends and family working programs like Al-Anon, Nar-Anon, and Coc-Anon to a better sense of themselves, Twelve Step principles, and what it means to joyfully live a life of one’s own. A book of 366 thoughts celebrating the gifts of the Third Step of Alcoholics Anonymous and Al-Anon. Guides readers in understanding and strengthening their connection with a Higher Power, however they choose to define that presence. Offers encouragement and guidance for “practicing the presence of God” in daily life. This complete resource brings together personal stories of recovery, Twelve Step guidance, and 90 daily meditations to help us become nicotine-free. A book of 52 meditations that offer the reader a peaceful focus for each week of the year. For those who struggle to love and be loved. Clarifies the varieties of love: the love we show friends, family, a lover, even ourselves. Spanish version of the original meditation book. Repeats the original 366 thoughts from Karen’s first meditation book but with space at the bottom of each page for the reader’s individual thoughts. Inspired by millions of women who have made Each Day a new Beginning their daily companion, this journal version of the beloved meditation book allows you to personalize favorite passages. Record your hopes and fears, your triumphs and setbacks, as you reflect on the lessons found in living each new day. With insight and clarity, daily meditations explore common issues that women struggle with, from loneliness and shame to spirituality and hope. Women in recovery, as well as all women interested in personal development and self-discovery, will find guidance and affirmation in this invaluable journal. written by Jordan Storeby, my 13 year old grandson, is an ideal book for parents and boys to read together. It’s never easy to get boys to open up about their feelings. They often carry this resistance into adulthood too. Getting used to the idea of talking about feelings is what the book is designed to do for boys. The idea for the book came from a discussion Jordan and I had after he came home from school excitedly exclaiming that one of his classmates brought my book for young girls, Girls Only! as a show and tell item for the class to see. I then suggested he write one for young boys. And over the next 18 months he did! It’s a wonderful book and promises to be helpful, not only to young boys but their families too. Children and their parents talk far too little about what really matters. The troubled world around us offers plenty of evidence.